Use your camera to show us how you feel or think about a particular place. This place may be natural or industrial, or in between. It may be a park, a neighborhood, a home, the ocean, etc…. When we look at the photos we should understand this place the way you want us to without a verbal description of your idea. Shoot at least 60 images. There is a rich history of landscape imagery (natural or urban) in the history of photography. In this assignment we will examine some of the ways in which the land has been used to address ideas about location, ownership, preservation, destruction, etc. Here are some photographers to begin your research with: Timothy O’Sullivan, Wynn Bullock, Alfred Stieglitz, Minor White, Ansel Adams, Robert Adams, John Sexton, Josef Sudek, Eugene Atget, William Eggleston, Steven Shore, Richard Misrach. 8-12 images of your interpretation of landscape. 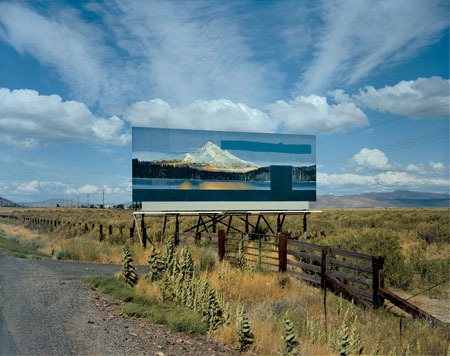 Steven Shore, Color Photograph, U.S. 97, South of Klamath Falls, Oegon July 21, 1973.